When we were in southeastern Moravia to collect reed canarygrass, close to the point where Austria, the Czech Republic (Moravia), Slovakia and Poland converge, we were shocked but pleased to learn that the Lichenstein's had owned much of this region. The city of Valtice was where the Lichenstein brothers built their residence chateaux or castle. 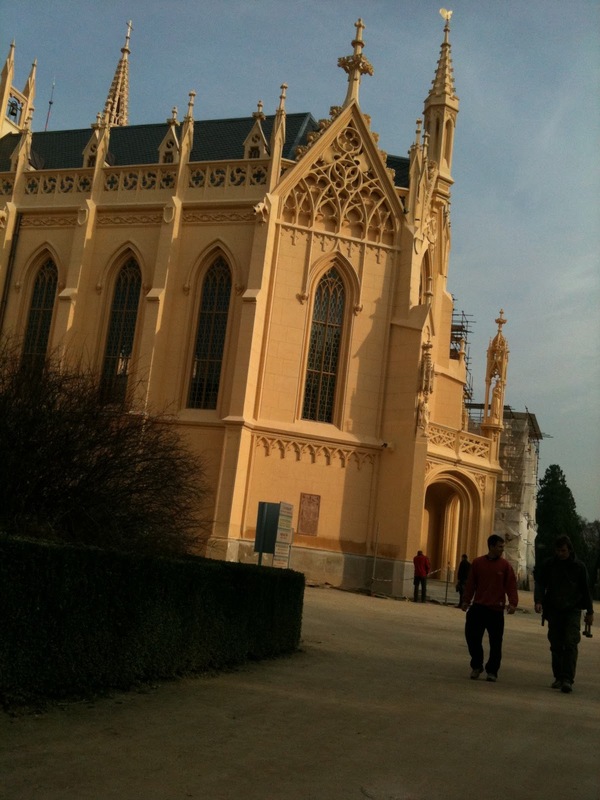 In the neighboring village of Lednice they built their guest chateaux, chapel, greenhouse (orangerie), and beautiful gardens all for their guests! All of the surrounding area between the two castles are landscaped similar to Versailles, along with a host of 'follies' that they built. We stayed in Lednice at a fun Penzion where our hosts Jan and Stepan have stayed for several decades when they come here to do research in the nearby Salt Marsh (a posting on that coming soon). Join us for exploration of both Lednice (this posting) and Valtice (next posting) castles and grounds! The entire area is now a UNESCO Cultural Heritage site (there are many of these in the Czech Republic that we've visited). Here is an artist's sketch of the landscaped area for the castle (zanek) here. a couple of views of the buildings (the building on the right was under reconstruction when we were there). Here is the horse stable, built in the 1600s. Now some glimpses of the beautiful gardens (still gorgeous even during late October - early November when we were there). 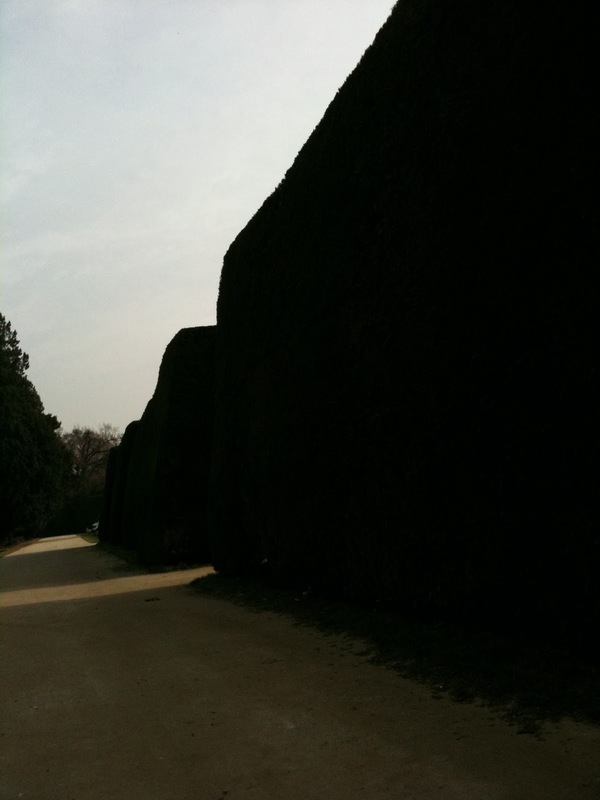 The yew or Taxus hedges are immense, forming great walls, as you can see. 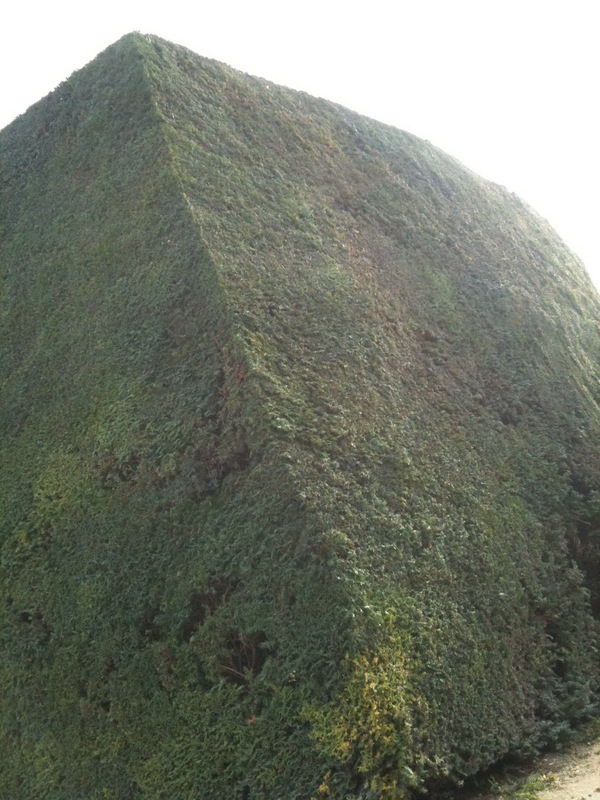 Don't the yew hedges look like living pyramids?! Their simple lines and angles make them monumental plant sculptures in the landscape. We can hardly wait for spring to come for another visit to see the gardens and wildflowers in bloom! We learned that several famous spring bulb species are native here, including Snow Drops (Leucojum), lily of the valley (Convallaria)! Then there was the greenhouse (palm house), the Orangie to look at. Here you see that the greenhouse dates back to 1843....just before Lord & Burnham invented glazing compound (putty) to embed glass into the sashes. Most of this is the ORIGINAL glass....quite amazing! Past the greenhouse was the orangerie, a building underground with these domed light sources and vents (open below) to allow light in and heat out during the cold, dark winter months. Plants in pots, particularly citrus, were kept in here during the winter. Then they'd be brought out and kept on the terrace during the summer. Here are some of the palm trees in pots, ready to be wheeled into the Orangerie for winter storage...waiting for springtime! Lest you think you can take one of these citrus or palm trees home, the wolf and lion guard the entrance to the Orangerie and Greenhouse, bearing the Lichenstein shield (right). The weeping alders, birch, and other deciduous trees/shrubs surrounding the Orangerie were starting to paint their leaves for fall coloration. Here's a fantastic yellow Cotoneaster, sparkling in the fall light. Then we were surprised to see that many of the trees in the landscape were bedecked with mistletoe! As we mentioned earlier, the landscape is full of 'follies'. These are structures built for integration into the landscape to mimic architecture styles and buildings around the world. For instance, a minaret, the ruins of a castle (not really old at all), etc. There are several such 'follies' around the Lednice and Valtice area. 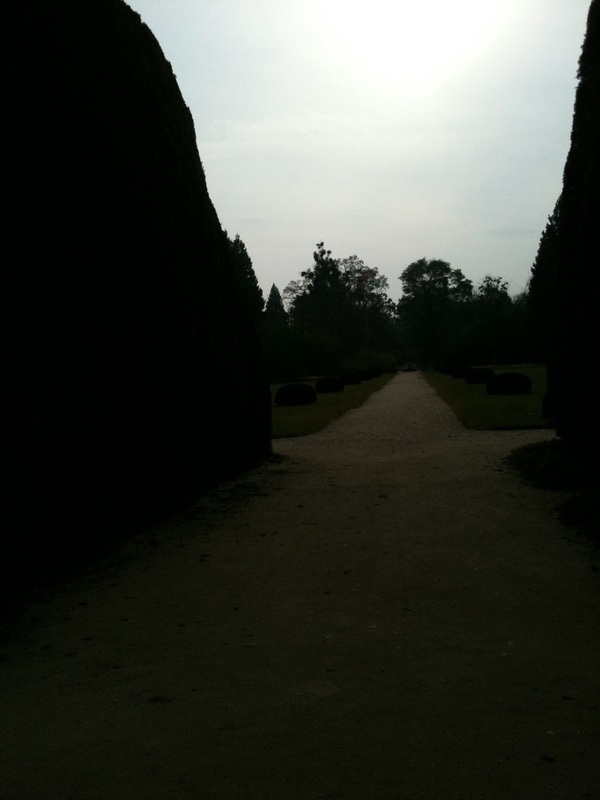 Do join us next spring to explore all of the landscape follies!